1. The entire story is written in enumerated lists (like this one). 2. 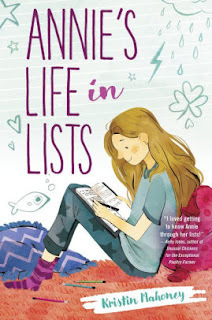 It's a story about a fifth-grader named Annie who moves from Brooklyn to the small town of Clover Gap. 3. In addition to her love of lists, Annie has an incredible memory. 4. Sometimes having a good memory can get her into trouble because people think she's strange or she talks about something obscure she's remembered. 5. But Annie's biggest problem is shyness. 6. Which doesn't stop her from making new friends and working on making a new home. 1. The lists were not as obnoxious of a literary device as I feared. 2. Mahoney is a good storyteller. 3. Even the mean characters were not so bad. It was a fun and gentle story. 4. The illustrations were cute and added some whimsy to the story. 1. The book's structure means that sometimes you don't get a lot of depth. 2. Occasionally, Mahoney cheats and adds an extended comment on the end of the list, which breaks the structure.